Wireless geotechnical monitoring helps reduce some of the risks associated with underground mining. 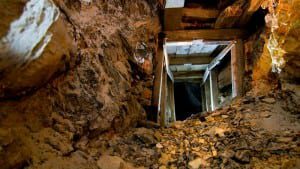 Rock falls, cave-ins and collapses are very real risks in an underground mine. These disastrous events can lead to serious injury, or even death, damage or loss of mine equipment and facilities, and cause substantial production delays. One of the best ways to mitigate the risk posed by unstable ground and rock faces is to have a comprehensive geotechnical monitoring infrastructure. Ideally, this infrastructure should consist of a series of relevant geotechnical monitoring instruments that are connected to a central network. This allows data to be efficiently collected, moved to a central point, and analyzed. This data can then be used to continually monitor the state of the geological environment and formations in and around the mine, acting as a type of early warning system, so dangerous situations can be managed and the risks reduced. However, due to the increasing depth and scale of many modern mines, placing geotechnical monitoring instruments in remote parts of the mine, and collecting data from them, can be a significant challenge. The ideal solution to this problem is for the geotechnical monitoring network to be of the wireless mesh type. In this type of arrangement, robust monitoring instruments, connected in sets of three to battery-powered wireless nodes (with a battery pack lasting up to three years), collect data and send it from node to node, over long distances if necessary, until a network gateway is reached. At that point, the data will enter the mine’s existing LAN network and be available to mine engineers for interpretation and use.